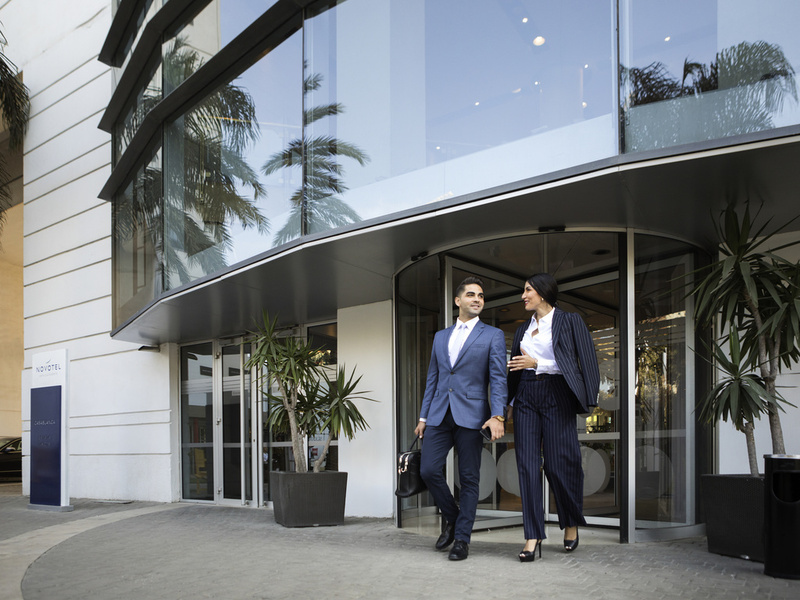 The Novotel Casablanca City Center hotel is the ideal base for exploring the city's tourist attractions. Our hotel is located a 10-minute walk from the Old Medina and Place Mohammed V. The Hassan II mosque is just 1.2 miles (2 km) away and can be seen from a number of our rooms. Located in the business district, our hotel is also within easy reach of a number of bars, shops and restaurants. Mohammed V International Airport is 45 minutes away. I really suffered and was exposed to burn injury 2nd degree due to hotel negligence and the kettle with broken top that resulted in burning my left forearm with boiling water instead of pouring water in the cup. I had to continue my work during my duty travel and until now I am under treatment with risk of major scar! Needless to mention thx severe pain in suffered from. Just stayed one night. It was a very smooth pleasant stay. The staff was friendly and helpful and the room was in good order. Nice room & walk in shower, it would help if it was a little bit bigger but still it fit for purpose, AC is not cold enough ,Very nice breakfast, perfect location near casa port and old city, friendly and nice team who have helped with a smile all the time especially the reception team. One point may be not related to the hotel is the grand taxis outside who are always trying to make huge money from any tourist, overall experience is great I would come over again it feels now like my home in Casablanca. Near to shops, restaurants and just next to the main train station. Access to taxis is very easy. Comfortable bed and room. Reception staff were very cooperative and polite. Breakfast is average but nice. Monsieur Bokonda b., Nous vous remercions pour vos commentaires suite à votre séjour à Novotel Casablanca City Center. C’est avec grand plaisir que nous recevons vos compliments. Aussi, nous ne manquerons pas de partager vos appréciations avec toute notre équipe. Votre satisfaction est la plus belle récompense pour notre personnel qui travaille jour après jour pour vous offrir un service irréprochable. Dans l’attente de vous accueillir de nouveau, nous vous prions de croire, Monsieur, en l’expression de nos sentiments les meilleurs. Good , courteous customer service . Great to be able to have a smoke as well near bar . Hotel was part of a group trip with Gate 1 Travel. I stayed an extra day in Casablanca. The front desk Staff was very helpful and assisted me with communication involving my airport transport. Good hotel with comfortable rooms. Good selection of meals at the restaurant and good breakfast in the morning. The staff was very nice and the breakfast buffet was good. I opted for a prepaid dinner voucher and that was a mistake. The menu was very restricted and not very good. I would have done better to just order ala carte. Then there was confusion about how many nights I actually ate dinner at the hotel. Eventually it got straightened out. There is a lot of construction going on around the hotel, including one building that is 24 hours a day. So it’s not the best location. Dear, Thank you for taking the time to share your observations with us following your stay at Novotel Casa City Center I have taken note of your comments regarding all the issues you have mentioned and would like to express my sincerest apologies, kindly Know that i will not hesitate to share your comments with my whole team. I hope this incident will not leave you with a bad impression of the Novotel Casa City Center and I hope we will have the pleasure to welcome you again very soon. Thank you again for taking the time to contact us and please accept our sincerest apologies Best Regards. The hotel is wonderfully located next to the Casa Port train station with direct connection to the airport. But when asking at the front desk the reception was unable to provide me with a timetable or indication of when trains leave. It turns out to be quite simple - every hour at five minutes to the hour. Instead I was told the only way to get to the airport was by the taxis that wait out front - and only the red ones, not the white ones. It's tiring in Morocco trying to figure out what's the truth and what is done because commissions are paid between services. I could not figure out how to use the telephone to dial for a wake-up call. I stay in lots of hotels. I felt a bit robbed by the hotel when told that the water in the rooms should not be consumed. I was pointed to the concession where water is priced at 40 dirhams. Any corner store is priced at 10 dirhams for the same size. This is simply taking advantage of a situation. We were very pleased that you were able to check us in early. The airline had lost our bags and we were both sick when we arrrived. It was especially appreciated that we could get in the room for a shower, a nap, and work on getting our luggage back.